Bees in your walls? Honeybee comb on your property? We are honey bee hive removal specialists, removing combs out of walls, sheds, attics, roofs or hollow trees on your property. 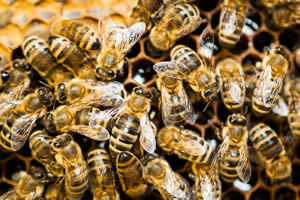 Our professionals safely get rid of bees and solve all of your honey bee hive removal problems. Although honeybees are very beneficial to the ecosystem and valuable for pollination; their population numbers are so high across most of the southern U.S. that they are often a pest problem, especially when found in or near the home or workplace. Many people are highly allergic to bees and can be hospitalized after just one bee sting due to anaphylactic shock that follows a sting. When bees sting they emit a chemical pheromone to signal the attack to the rest of the colony which commonly results in numerous stings. Bee stings are the largest killer of humans in the U.S. directly caused by animals. Government statistics indicate 40-100 people are killed annually from insect stings and this number continues to rise each year due to the increasing population numbers of the aggressive Africanized honeybees (also known as “killer bees”) that are taking over the southern states. Various subspecies of honeybees are found around the world. Honeybees construct colonial nests out of wax known as hives to produce and store their honey that is used as their food source throughout their inactive winter months. Most hives we remove consist of 40-60 pounds of honeycomb as bees typically require 30-100 pounds of honey to survive the winter. We occasionally remove even larger hives that have ranged from 100-200 pounds of honeycomb. If you see a swarm or cluster of bees in or around your home or office or see numerous bees flying in and out of cracks or gaps on the exterior, you are in need of bee removal and honeycomb removal. trapper J is is equipped to remove the bees and extract and clean all honeycomb from the interior voids within your structure. Bee removal can be very dangerous and should be left up to a licensed professional. Trapper J, a North Louisiana Honey Bee Hive Removal specialist is the most professional and humane nuisance wildlife control service available in Monroe, West Monroe, Ruston, Bastrop, Alexandria, and Pineville in the North and Central Louisiana area.